Situated in Abbadia San Salvatore, this spa hotel is within 1 mi (2 km) of Abbazia di San Salvatore and Mining Museum Park. Baths of San Filippo and Monte Amiata are also within 9 mi (15 km). 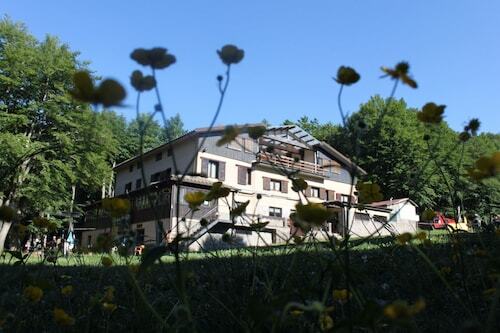 Situated in Abbadia San Salvatore, this hotel is 0.2 mi (0.4 km) from Monte Amiata and within 9 mi (15 km) of Mining Museum Park and Parco Piscine Capenti Outdoor Pool. Abbazia di San Salvatore and Mount Amiata Fauna Park are also within 9 mi (15 km). 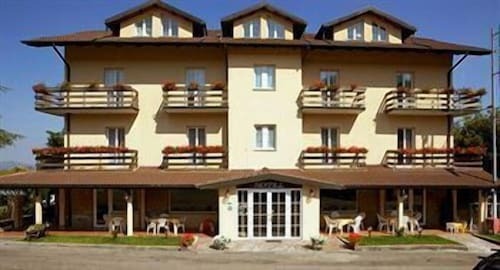 Situated in Abbadia San Salvatore, this hotel is within 1 mi (2 km) of Mining Museum Park and Abbazia di San Salvatore. Baths of San Filippo and Monte Amiata are also within 9 mi (15 km). Situated in Abbadia San Salvatore, this hotel is within a 15-minute walk of Abbazia di San Salvatore and Mining Museum Park. Baths of San Filippo and Monte Amiata are also within 9 mi (15 km). 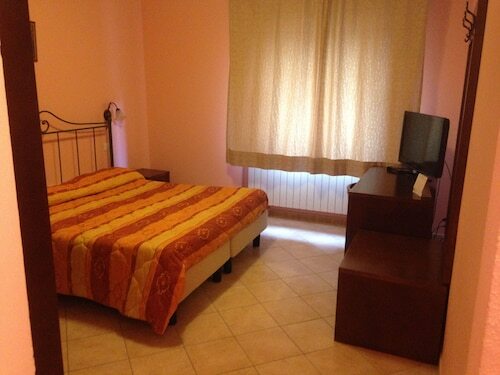 How Much is a Hotel Room in Abbadia San Salvatore? Hotels in Abbadia San Salvatore start at $53 per night. Prices and availability subject to change. Additional terms may apply. You'll find an extensive range of places to stay on Travelocity to consider when dreaming about your trip to Abbadia San Salvatore. Take your pick from around 10 accommodation options within a 6-mile (10-kilometer) distance of the center of Abbadia San Salvatore that are part of Travelocity's extensive booking portal. Within 0.6 miles (1 kilometer) of the downtown area, readers of Travelocity will find comfort knowing there are the range of hotels, like the Hotel San Marco and Albergo Ristorante Olimpia. You could also try the Rosewood Castiglion del Bosco along with the Terme di Saturnia Spa & Golf Resort. The Rosewood Castiglion del Bosco can be found 19 miles (31 kilometers) away from the heart of Abbadia San Salvatore. 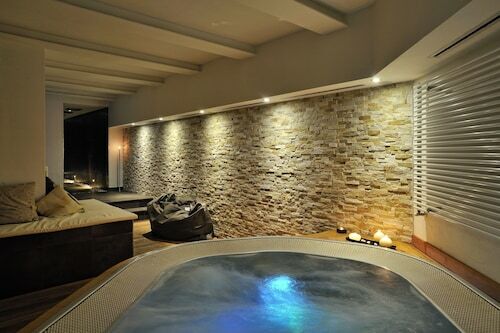 The Terme di Saturnia Spa & Golf Resort, is 18 miles (29 kilometers) away. 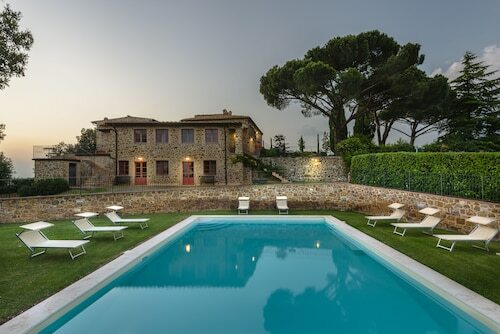 Two other hotel and apartment options in the region include the Castello di Velona SPA Resort & Winery along with the Adler Thermae Spa & Wellness Resort. If time allows, enlightened travelers should discover the sights of Tuscany. Explore Tuscany's ruins and see the region's rural landscapes and beaches. Popular pastimes in this particular region of Italy include snowboarding and skiing. On the hunt for things to do? You could spend the day seeing Archeological and Collegiate Church Museum and Torre Rognosa, in Val d'Elsa, 45 miles (74 kilometers) northwest of Abbadia San Salvatore. The Tenuta Di Mensanello and Torraccia di Chiusi are some of the comfortable lodging alternatives in Val d'Elsa. 10 miles (16 kilometers) northwest of Abbadia San Salvatore, you'll reach Val d'Orcia, which features the Hotel Osteria Dell Orcia and Locanda del Loggiato. The Collegiate Church of San Quirico and Palazzo Chigi are some of the more popular points of interest to experience when you're in Val d'Orcia. Before you make your way home from Siena, why not make sure you enjoy enthusiastic locals watching a thrilling match. Stop by Stadio Artemio Franchi - Montepaschi Arena, found to the northwest of Abbadia San Salvatore. Those sports fans that would like to sleep close by can select from the Residenza d'Epoca Relais Campo Regio or the Palazzo Coli Bizzarrini. Situated 70 miles (109 kilometers) from central Abbadia San Salvatore is Peretola Airport. Stay nearby in Travelocity-listed accommodation at The St. Regis Florence or The Westin Excelsior, Florence.